When looking at the best solar panels for your RV you might be wondering which is better, flexible solar panels vs rigid? Both of these types of panels have their own positives/negatives which make them better for certain circumstances. Since this question is asked a lot we had to write an article on the topic. Down below we discuss both options and their benefits. We recommend looking at each option until you decipher which one is best suited for your energy needs. There are many types of solar panels that use different materials and have their own power outputs. The two most popular options when it comes to RV solar is flexible panels and rigid solar panels. They both have their own pros and cons, some of which we list down below. Rigid solar panels, otherwise known as traditional solar panels are the of type of panels you see on top of most homes and business. These panels are typically built with corrosion resistant aluminum frames and tempered glass. Rigid solar panels are very durable and can easily handle the wear and tear outdoors. In some cases they can even withstand winds up to 2400Pa and snow loads up to 5400Pa. This extreme durability allows them to last decades without breaking. Most modern rigid solar panels are extremely efficient and have conversion rates up to 20%. This high-efficiency allows the panels to generate more energy with less surface space. What Are The Pros Of A Rigid Solar Panel? Durable design ensures years of use. What Are The Cons Of A Rigid Solar Panel? Flexible solar panels are commonly used on RVs, campers, and boats. Unlike rigid solar panels, flexible solar panels don’t use an aluminum frame or glass. Instead, they use a thin plastic back-sheet and film to protect the solar cells. This setup allows flexible solar panels to bend to a maximum of a 30 degree arc. This flexibility makes them ideal of irregular surfaces that are on RVs and boats. In addition they are a lot lighter and aerodynamic than rigid solar panels. 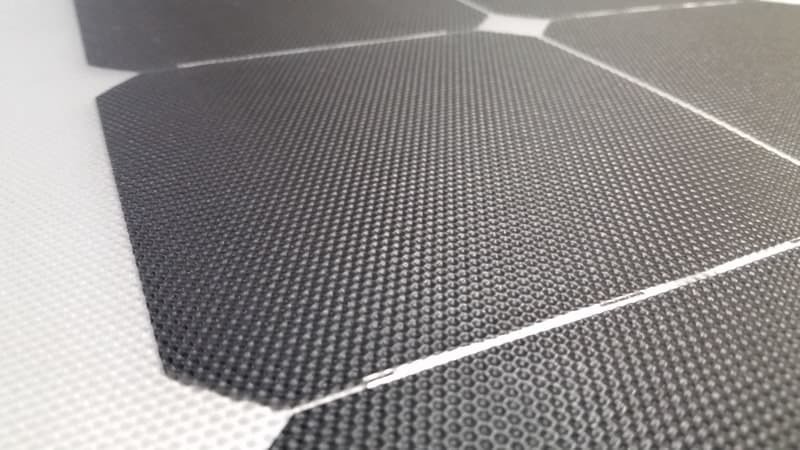 Most flexible solar panels use metal eye holes. These holes allow you to easily install the panels on a rope or permanently install on your RV. What Are The Pros Of A Flexible Solar Panel? What Are The Cons Of A Flexible Solar Panel? Can easily be cut by sharp objects. Can’t handle extreme hail or weather. Are more expensive than rigid solar panels. When analyzing both options you might be wondering which type of panel is better. In our opinion rigid solar panels are the best. They are simply much more durable than flexible solar panels and can last years in the outdoors without any issues. In addition rigid solar panels tend to have great warranties that cover up to 25 years of use. With that being said flexible solar panels are still a great option and perfect for certain situations. In most cases these types of panels are ideal RVs, campers, or boats. So if you need a lightweight solar panel that is bendable then they are the best option for you. When buying solar panels you want to purchase the ones with the best materials. These high quality materials allow the solar panels to operate at a much higher level than cheaper versions. In most cases higher quality solar panels can generate more energy at a much more efficient rate. In addition, quality materials allow solar panels to be much more durable. Solar panels with quality materials are water and dust proof. This allows them to withstand the wear and tear of the outdoors with ease. These quality materials also allow them to last longer without loosing efficiency or dying. Energy efficiency is a big factor to contemplate when looking at solar panels. In most cases mono-crystalline solar panels have the best efficiency. This high-efficiency allows the panel to produce more energy with less surface space. This means they are ideal for smaller areas like the roof of an RV or camper. Higher efficiency solar panels are also better as they are the latest technology in the industry.Just like cells phones, you don’t want to buy an out of date solar panel. Instead you want to buy the most modern options available as they are more powerful and reliable. The size of the solar panel is another thing to contemplate when looking at different options. Polycrystalline solar panels tend to be less efficient than mono-crystalline solar panels. This inefficiency means the polycrystalline solar panels must use more space in order to generate the same amount of energy. If you’re looking to install solar panels for your RV or camper then 100W monocrystalline solar panels are the best. They are relatively small and can fit onto confined spaces. On the other hand if you’re looking to install solar panels on your house then 250W monocrystalline solar panels are your best option.. While the cost of solar panels has dropped significantly, they are still relatively expensive and a big investment. Since you will spend a large amount of money when buying them, its essential to purchase ones with long warranties. Most solar panels online come with at least a 1 year warranty. Larger solar companies typically provide better warranties at 25 years. Other parts such as inverters and charge controllers have shorter warranties at around 10-15 years.